Review Context: I’m an avid fan of metroidvania style platformers. I’ve also played and enjoyed the previous Shantae title, Shantae: Risky’s Revenge. 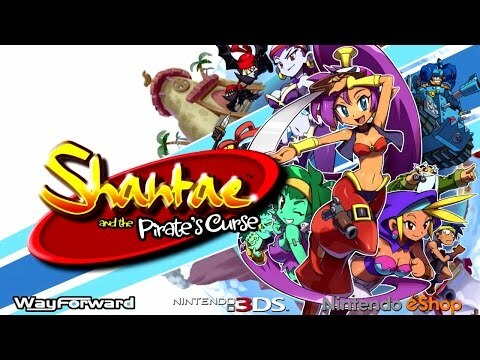 One of the more overlooked titles on the Wii U, Shantae and the Pirate’s Curse is a part of the new platforming indie craze. Shovel Knight, Shantae, Axium Verge, and many others are a part of the new retro gaming craze trying to bring back the metroidvania/platforming style of play. Shantae was one of the frontrunners seeing its return after eight years of dormancy with the DS title, Risky’s Revenge, meeting critical acclaim. 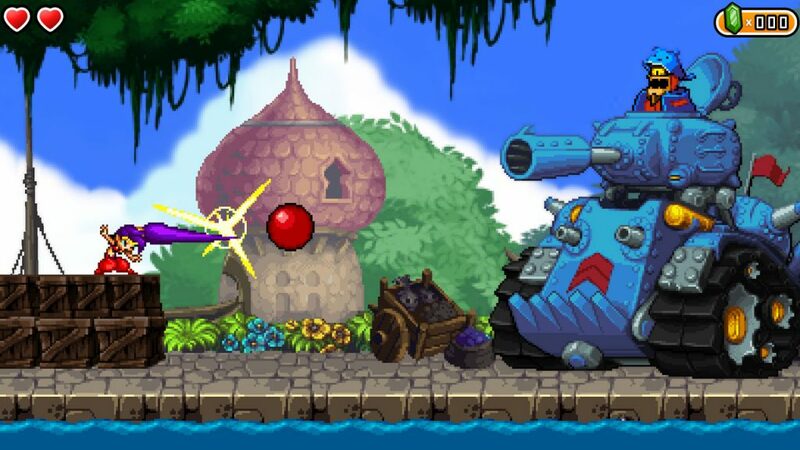 WayForward Technology garnered much needed praise with its return to classic platforming splendor and proceeded to create the sequel Shantae and the Pirate’s Curse. After it was launched, its ability to make use of its retro platforming roots and perfect them only excelled it to the forefront of the Wii U library with its release in the end of 2014. Shantae and the Pirate’s Curse’s story is slightly more focused than other platformers and certainly is not without its charm. 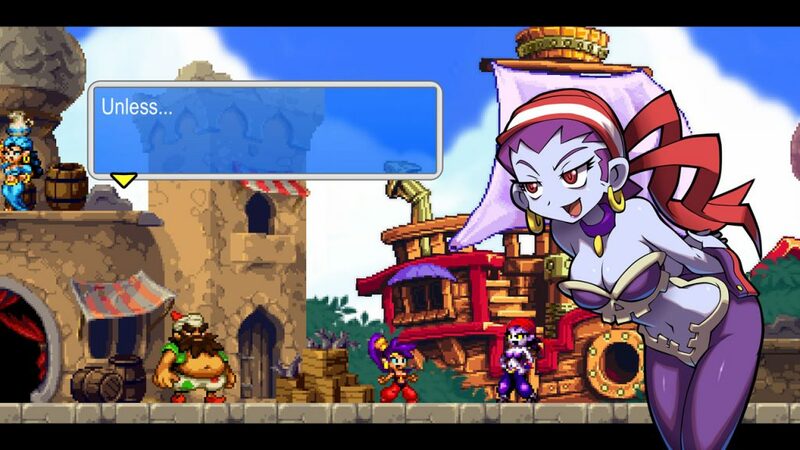 Shantae is a half genie having previously lost her powers from the last game and now faces off against her most dangerous enemy yet, The Pirate King. She must then team up with her archnemesis, Risky Boots, in order to stop this new threat to Sequin Land. The interesting dynamic between these two characters certainly makes for some of the best interactions in the game. Each character has a stand out personality making them memorable to the viewer, along with witty dialogue paying tribute to the prior games within the series. The writing is through the roof with each crazy scenario you find yourself placed in throughout the story. Whether its powerful light reflecting skin or undead curses lending you a hand, there is almost never a dull moment. Though the humor is one of the high points to the game, newer players to the series will not understand every reference to prior games leaving some of the humor moot. The structure of the world is more streamlined and smaller per area, but larger and longer all around than previous installments. This being each area is now an island rather than being around the region of Sequin Land. With smaller, but grander in scale island maps, allowed areas to be more specialized and focused, but at the same time it feels like a point A to point B game despite its exploration. The unique gimmicks to some islands make it worthwhile at times. Some sections like the desert palace’s stealth portion of Tan Line Island give a sense of variety to the platforming. This cannot make up for the enormous amount of backtracking from island to island in order to progress making some sections quite agitating. You may have made it to the new island, traversed through some places and come up to a roadblock which then you would need to go to another island to fetch an item in order to continue. Fetch quests will easily be your bane sometimes in the sense of progression. The metroidvania style seeps into Shantae and the Pirate’s Curse’s every pore. The exploration aspect makes each little secret feel extremely rewarding as you hunt down the collectibles much like Super Metroid with its grid like map design. Each island’s aesthetic lends itself to hidden areas which makes searching for each one that much more satisfying thanks to the focused map design. Heart squids which will eventually lead to extra life and Cacklebats are spread across the islands. The Cacklebats contain the essence needed for a full completion of the game and at times it will become quite tiresome backtracking to find the ones you have left behind creating quite the completionist run. It’s fair but slightly challenging for newer players to the genre, but will feel like a welcomed homage to veterans. The dungeons often require fetch quests in order to reach them, but they feel slightly less treacherous than the world itself at times, especially in the earlier levels. Each dungeon’s aesthetic comes from the island, but that unique feel from the island’s theme seems to be washed away by the gloomy color palette making each feel the same at times. You travel around to each island’s dungeon in search of Risky’s pirate effects such as her sword and pistol, each with their own special abilities to be used by Shantae. Shantae this time around does not have her genie abilities like previous games and are replaced with Risky’s weaponry. The weaponry is seamless and is almost never finicky on the controls. Once you receive a weapon, there will always be a simplified obstacle where you must use the weapon to escape the room. The dungeon then becomes a training ground where you master said weapon through progressively difficult puzzles/obstacles. This training prepares the player for integrating said weapons later on through the islands. It may even force you to utilize multiple weapons at once to access hidden areas as you hunt them down with your completed inventory. The platforming sections gradually grow more difficult as you collect more of Risky’s weapons. This shows with the final level as it tests your ingenuity as you utilize all your skills to perform some precise platforming feats much like the Super Mario Bros. series in their later levels. The breaking of blocks and the hitting of switches are some of the bare minimum of what this platforming entails as it does not reinvent the mold. The puzzle aspect mostly comes into effect in the dungeon sections of the game. Puzzles will never truly be brain-rattling unless it is hunting for a collectible, which forces you to utilize your new weapons and skills or face a harder rendition of a past obstacle. At times though some sections can be frustrating, much like the tentacle mouth monster which launches you in set directions, it can cause some disorientation with what direction you are going at points. The puzzles are not meant to break the momentum of the game, but rather to pose an initial challenge for your first time playing. It does not hinder those who wish to speedrun the game after completion for extra rewards in a second run through. 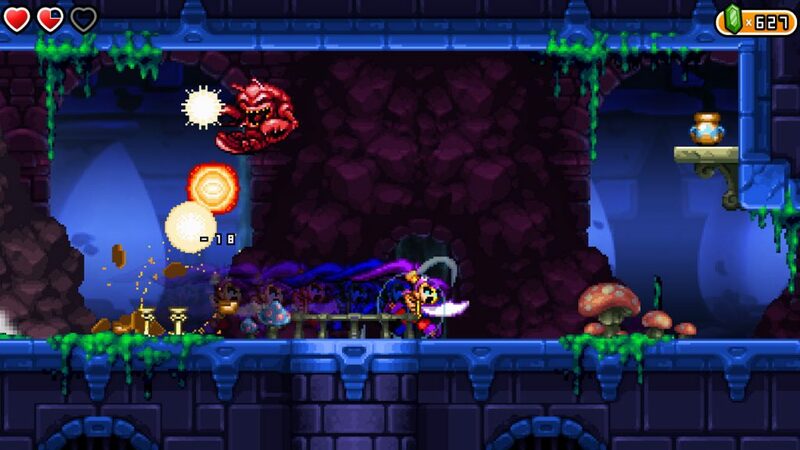 Shantae’s range of attack is limited at the beginning until she continues to gather up Risky’s weapons. Her hair whip attack will get stronger as you buy upgrades as the game progresses, but some enemies will only become tedious with the respawn rates on islands like Mud Bog Island. The enemies will take longer than expected to destroy leaving you running back and forth some times with enemies being a pain to take out over and over again. Later in the game these respawn rates will be the only thing deemed as cheap, as enemy placement is quite tactful as to never seem unfair to the player which in a metroidvania game is a must. Unfortunately, the earlier islands in the game are much easier than the latter portion, as the jump in difficulty will certainly be a shock for those unprepared for it. Items and the like can be bought to give additional damage or stat boosters, but other than healing items none of them are truly essential and only make the game go by somewhat faster in boss fights. Jake Kaufman creates a beautiful soundtrack filled with metroidvania style inspired music. Whether it be Oubliette of Suffering’s foreboding theme, “The Desolate Domain”, or the upbeat Middle Eastern styled song “We Love Burning Town”, Kaufman’s music beautifully defines each tone to the area or dungeon. Each island’s aesthetic is defining and unique to Sequin Land, despite some of them returning from previous installments. The bright color palette in some areas such as Scuttle Town is wonderfully contrasted with the more depressing and dark colors of Mud Bog Island, creating a large assortment of contrasting ideas with the worldbuilding. It certainly makes it stand out among the rest of the modern retro style platformers of today with its personality. The only nitpicks are with the formatting from the 3DS to the Wii U. On the TV screen the game will not fit the entire screen and be chopped off around the edges, the most noticeable spot being the hearts in the top left. With the game originally being used for two screens, when playing on the gamepad you will need to switch the screen to use your items. This will break the momentum of the game, but is only a slight hindrance. Despite some hiccups, Shantae and the Pirate’s Curse looks fantastic on the big screen with HD truly making its beautiful aesthetic pop. Shantae and the Pirate’s Curse is a welcomed addition to any Wii U library as it is up there with Shovel Knight as some of the best of the genre for both casual players and veterans. With the game being twice as long as Risky’s Revenge, it just means that they needed to up the ante when coming up with collectibles, humour, and areas to explore and they did that in spades. The switch from genie powers to pirate weaponry was seamless and was a welcomed change allowing for more combinations of skill involved puzzles. The aesthetic and soundtrack highlight the fun and thematic atmosphere throughout Shantae’s adventure making this a true return to metroidvania form in the modern day. Shantae and the Pirate’s Curse certainly has made its mark as one of the more unique and creative platformers around. lots of valuable information, thanks for providing these information.